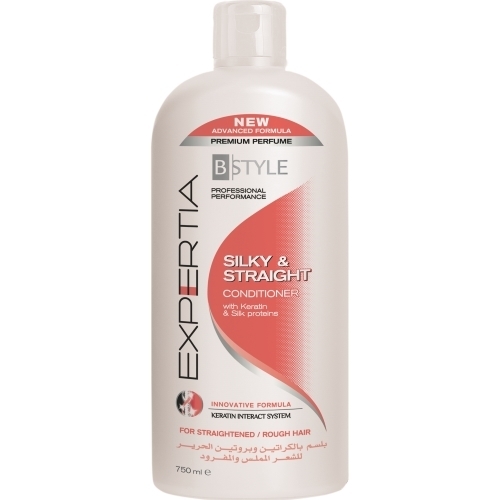 B-STYLE SILKY & STRAIGHT CONDITIONER 750ML – HAIRDEPOT - Hair & Scalp Care Products, Prevent Hair Loss, Shampoo, Conditioner, Treatment, Styling, Appliances and more! Ideal for Straightened/ rough hair. The formula of the Silky & Straight conditioner is based on the beneficial properties of the Keratin amino acids, which help keep and restore hair&apos;s natural balance and healthy look. The silk proteins contained, deeply revitalised and hydrate your hair giving Shine, vitality and softness. Straightened/ rough hair regains a supple texture with a soft touch and shine. Detangles and makes hair easy to comb without overburdening it.